The villa situated close to Jalan Raya Seminyak and only minutes away to get to the boutiques and famous restaurants or known as “eat street” in Jalan Oberoi (Jalan Kayu Aya). 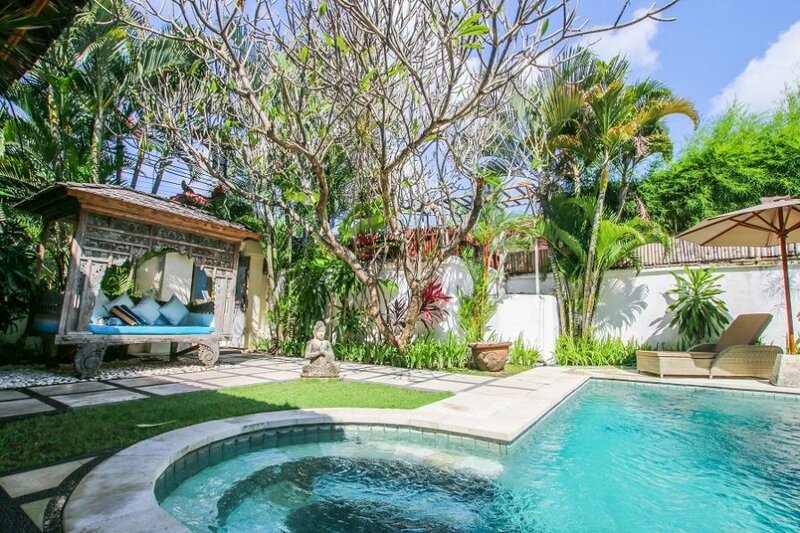 The villa situated close to Jalan Raya Seminyak and only minutes away to get to the boutiques and famous restaurants or known as “eat street” in Jalan Oberoi (Jalan Kayu Aya) also just 10 minutes walking to the beach. Comes with artistic design and open space kitchen that connected to the living room which you can enjoy the breeze while chillin. This villa is two storey and has 3 bedrooms with full AC and has fantastic swimming pool with sundeck and gazebo alongside the pool. We arrange airport transfer and get FREE airport pick-up for minimum of 3 nights stay. You also can get SPECIAL rates and benefits for LONG TERM booking. You have access to UNLIMITED internet, tea, coffee, and drinking water. Access to a DVD player with a big collection of movies accompanied by a stereo sound system. All kitchen equipment is at your disposal, a hair dryer, and a safety box. The villa is thoroughly cleaned with a regular change of towels and bed linens plus pool and garden cleaning. A full breakfast can be prepared as per your request, start from just $5. Private parking is available while transfer from the villa to the airport costs $20 for a group of up to 6 people.